Hurricanes, Floods, and Locusts — Hurricanes and other natural disasters (including insect infestations or mold) could strike tobacco producing countries at any time, devastating the tobacco crop, limiting supply, and driving up the prices of whatever remains. If you have enough cigars before disaster hits, you can ride out the storm. Stupid Politicians — They’re only one vote away from levying a massive tax on cigars or outright banning our combustible tobacco treats. There is, however, one sure way to avoid paying the taxes of the future (or having to purchase black market cigars of questionable origin): Start storing up now. Food and Booze — Enjoying some fine dining or top shelf booze? Everyone knows that a good meal or great spirit is made better when followed by, or enjoyed with, a good cigar. You’re practically throwing your money away every time you eat or drink and fail to top it off with a fine smoke. Cheap — I’ve said it before: Cigars are cheap compared to most entertainment and would still be even if prices doubled tomorrow (not that I’m in favor of that). Think about it, a trip to the movies can can run $40 for two people, a baseball game twice that much. Yet for five or ten dollars, you can smoke a cigar for an hour or two. Basic economics tells us when something is so under-priced it should be bought up. Aging — Cigars, at least many good ones, get better with age. Months, years, or even decades can do wonders for the flavor of a fine stogie. The problem is waiting for the cigars to age without smoking them all. Fortunately, there is a solution: Buy so many cigars that it’ll take years to smoke them all. Celebrations — There are countless reasons to celebrate, and many often come up unexpected. The only way to be prepared is to have a massive stash of cigars ready to go. After all, you can’t plan a drunken Vegas wedding…but you can have enough smokes on hand to celebrate the occasion. Investment — The stock market is tanking, mortgages are defaulting, and inflation is killing the dollar, but cigars remain a good investment. Think about it. If you bought a box of Opus X cigars one year ago, it would have out-performed pretty much every stock in the Dow Jones. And given all the reasons on this list, demand (and thus prices) will only go up. Bargains — Nearly everyday there is a great deal on one website or another, or at your local B&M (not to mention the StogieGuys.com “Deal of the Week” featured in every Friday Sampler). Any of these could expire tomorrow, leaving you stuck paying more for a cigar than you otherwise would have. Therefore, it is always smart to take advantage of these deals, right? Idiot Repellent — Let’s face it: There are a lot of dumb, annoying people around, and the dumber and more annoying, the more likely they are to give you their unsolicited, unwanted, and uninformed opinions. Fortunately, these stupid people are also the most likely to be annoyed by the wonderful aroma of a fine cigar, making smoking the perfect way to keep such undesirables away. Got a better reason for buying cigars now? Let us know in the comments. The last one is the best reason… Nothing keeps those annoying do gooders away like a big stinky 60 rg cigar! Reason #10: There aren't enough hours in a day, but smoking a cigar forces you to sit down, relax, and take a little time for yourself. Buying more cigars now will encourage you to do that more often. While I approve of Patrick's list and his enthusiasm, I should throw out a contrarian word of caution against "investing" in cigars as held commodities. Keep in mind that, no matter how valuable an item in your possession may be on paper, it's only worth as much as you can get someone to pay for it (and reasonably quickly, depending on your liquidity needs). 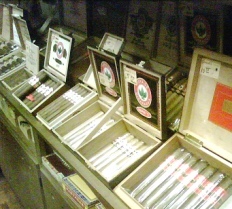 If, heaven forbid, the economy sinks even lower than it's already sunk, you'll have a very hard time selling off any of your stogies to fellow collectors, much less retailers or friends or other industry hobbyists. In my opinion, a great cigar held for many years is a personal investment in entertainment. It shouldn't really be seen as much more than that (unless you're incredibly well connected to deep-pocketed buyers, and happen to think you could broker rare cigars as a serious hobby).